There has been a rapid rise in the number of sports related and postural injuries in children, particularly adolescents, over the past decade. This is related to the fact that many children are either not physically literate or they are participating in too many sports, too many times a week at too great an intensity for their growing bodies to cope. According to the World Health Organisation, children should be accumulating at least 60 minutes of moderate to vigorous activity each day. The reasoning for this is to ensure optimum physical development in terms of bone strengthening, musculoskeletal growth, aerobic fitness and minimising the risk of obesity. Further benefits include increased ability to concentrate in class, improved sense of well-being and quality of sleep. Finding the correct balance between meeting physical activity guidelines and over-working the body is a difficult task to manage. 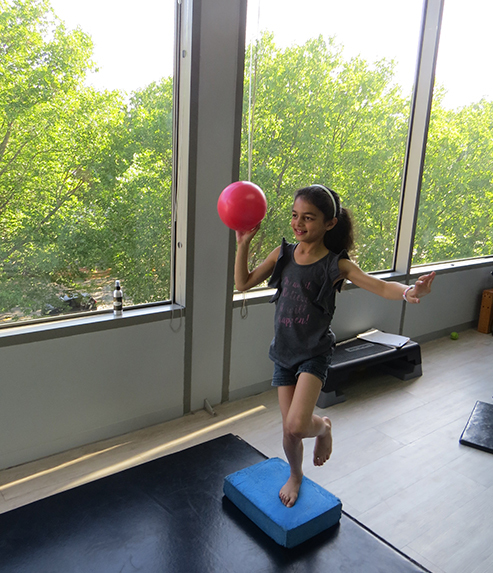 Before joining one of our Kids Pilates classes, we screen children to determine their level of physical development and whether certain milestones have been reached. A child development assessment includes an evaluation of any orthopaedic concerns, as well as a gross motor assessment which evaluates their locomotor and ball skills. Following the assessment, your child may join one of our group classes. 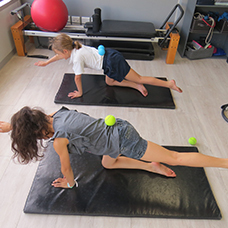 Our children’s Pilates classes are fun and stimulating for children aged from 6- 10 years old. Children are able to learn and expand their skills in a non-competitive environment. The areas of focus in our classes are posture, strengthening of the upper and lower body, core stability, balance, gross motor skills and flexibility. Pilates for children is a great physical exercise option for those that do not enjoy conventional sport or struggle in a competitive environment. As the classes are small, each child will receive individual attention to focus on the areas that are specifically important for them. Strengthening is achieved through body weight exercises, partner work and through the use of equipment. Children are sufficiently loaded to promote strengthening while not overloading the body with excessive weight which could lead to injury. Flexibility exercises are encouraged from a young age so that stretching exercises form part of the child’s daily routine. Lastly, core strength will ensure that your child is moving in the correct motor pattern which will filter through their motor behaviour in other sports, as well as improving their posture, especially at school.